Second home… – …STILL CRAZY AFTER ALL THESE YEARS! When I was little, come Chinese New Year, my father would take me and my brother to the barber for a haircut. I remember sitting on a plank placed across the arm rests throughout the whole process. He said we would have to get our hair cut before the day of the festival to get rid of the bad luck in the old year and to this day, I still observe this traditional practice. These days, I get Andy to cut my hair – he learnt the skill from Peter, the boss of Payung. I think I did mention before that Peter started off as a hair stylist in 1981 when he came back from overseas and opened his own salon here – as a matter of fact, I got him to do my hair for my wedding in December that year…and later, Peter started taking on students and began running a hairdressing school. To this day, he still has a small salon at the back, behind the café and his die-hard customers will still go back to him as and when the need arises. Well, Andy has a younger brother, Karan who was here helping out at Payung for two years before he went back two years ago. He did learn a bit from Peter as well but there, he enrolled in the L’Oreal Academy in New Delhi and now he is a qualified professional hair stylist. I sure was taken by surprise when I dropped by the café the other day and there he was! He had come back for a holiday and that just about shows the attachment those who had worked here before for the place, their second home, so to speak, and for Peter who always treats them like family…and he did not tell anyone, not even his brother that he was coming so everyone was shocked/surprised when he showed up. LOL!!! – I can never tell one from the other…and there is another variety that we call lau sai bua in Hokkien. 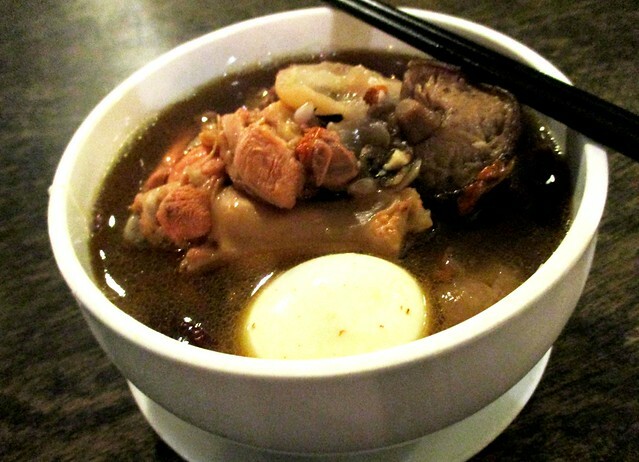 …in the traditional Foochow red wine chicken soup as a special treat in conjunction with Karan’s homecoming. 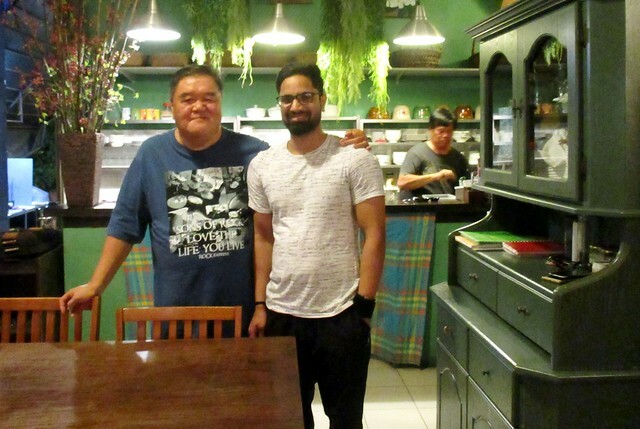 Like Andy, he loves mee sua a lot and also our Sibu kampua mee – needless to say, he wasted no time at all and went to enjoy a plate of that for breakfast the very next morning after the day he arrived. At first, I thought that was white fungus in my bowl but when I looked closer, it turned out to be lenggeng kua (dried longans). Usually we would add wolfberries or goji berries (枸杞) and red dates and shitake mushroom only but they have this in addition to all that and while eating, I also came across a bit of dong quai ( 當歸), just a bit so that was hardly noticeable in the soup but maybe that is their secret as to why their mee sua is so very nice but unfortunately, it is not on their regular menu. My missus did buy some dabai from the wet market that morning so we cooked some and brought them along and yes, Karan loves dabai too! It is pretty obvious that he loves a lot of things here and misses everything so much that instead of going some place else for his holiday, he chose to “come home”. Welcome back, Karan – it sure is so good to get to see you again. I do hope you will have the most delightful stay here…and yes, thanks so much for the very nice haircut! Wink! Wink! PAYUNG CAFÉ (2.284049, 111.833014) is located at No.20F, Lanang Road, Sibu, Malaysia, back to back with the multi-storey car park of the Kingwood Hotel which faces the majestic Rejang River. Nice photo! Peter and his boys are really a big happy family! 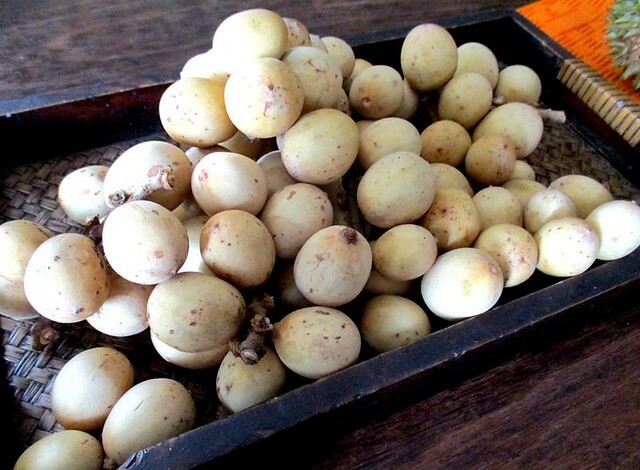 The dried longan would make the soup so much sweeter, we always put these dried longan when boiling herbal chicken soup. Yes, they sure are happy together and that helps set the mood at the cafe too, nice place to go for dinner and hang out. I will go and buy some dried longans and stock up on those for our own use. I never know Peter was a hair stylist before and runs a small salon at the back of his cafe. Very nice hair cut, all thanks to Karan. That bowl of mee sua looks very nutritious with all the extras added. He was, graduated overseas. I do recall him saying that he was in England. Yes, Karan did a good job, I sure like the end result. The mee sua is extra special – glad that Peter will always invite me whenever they cook it. Oh I see…. you and Peter go back a long way, eh? He sure is a man of many talents! Yes. At one time, he was into those carved furniture…and into landscaping and gardening as well. He still does a bit of the latter but not so much – hard to find workers, mostly for long-time customers. When I was younger, I remember my mum and dad cut our hair. And I remember we did it in the kitchen with newspapers on the floor to collect the hair. Lol. Of course we wouldn’t allow them to do so as we grew bigger. Hubby tried cutting the boys’ hair once but not successful. Ended up I needed to send them to salon. Lol. Nice hair cut. And nice shot with Karan. Thank you, thank you! No, my parents never cut our hair but my father would take us to one barber – I guess he’s no longer around. Aiyor!!! Why so kiam siap, want to cut their hair yourselves – let other people earn a bit of your money lah. Lots more where it came from. LOL!!! Yes, other than the lovely food here, they are all very nice friendly people. I did notice the shops and salons (and also the doctor’s offices) were especially busy in KL this week. I imagine much for the same reason as you getting your hair cut. I guess they all jack up the prices this time of year. I’m lucky – my friends do it for me for free. Hehehehehehe!!!! 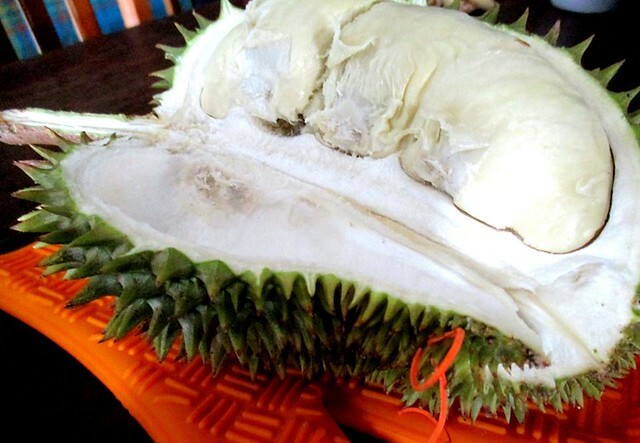 Maybe you should plan a visit here during the fruit season…and with our miserable ringgit, you will feel so rich here – everything will seem dirt cheap! Pingback: Way too much… – …STILL CRAZY AFTER ALL THESE YEARS! Pingback: Where did all the love go… – …STILL CRAZY AFTER ALL THESE YEARS!